Profitez de votre séjour dans notre charmant condo d'une chambre récemment rénové. Vous allez adorer l'emplacement de cette unité, à distance de marche du lac, des restaurants, des épiceries et plus. Il se trouve également à un pâté de maisons de l’hôpital Chandler et à 5 minutes du centre commercial Chandler. À proximité de 101 et 202. Et aussi, à seulement 15 minutes de l'aéroport Sky Harbor. Vous adorerez vous promener tous les matins autour du lac (un kilomètre) et, pendant la soirée, vous pourrez profiter d’un barbecue sur la terrasse avec vue sur le lac. L'unité est à seulement quelques pas de la piscine communautaire au bord du lac et d'un jacuzzi. 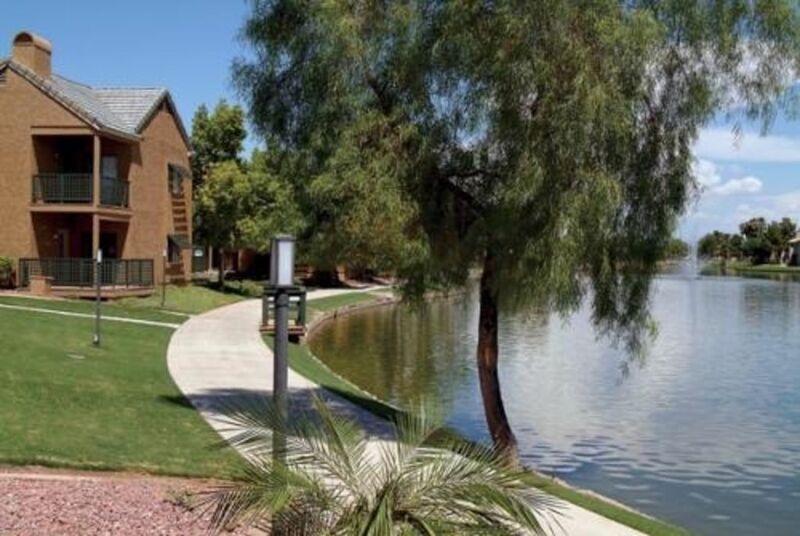 We like the condo and its location in Chandler. Easy to get anywhere. Shopping and good restaurants are short drive. Easy route to Sloan park. Parking spot very close to the door. Kitchen is well stocked with dinnerware and such. Dishwasher provided but no cleaning pods were provided, box was empty. Only other peevs were only two very small rolls of TP and one hand towel were provided . Need to be more generous on the supplies. Owner did not convey exact address and key code without prompting twice and only a few days before we left. Which created a lot of concern as this was our first time using VRBO. Otherwise this would receive at least four stars. This rental is a little small, but fine for a couple for a weekend. It is conveniently located near the highways which you use to get everywhere in Phoenix area. We enjoyed our stay at this location. It was very close to our son and other locations we frequented. It was very nice being able to walk next to the lake and to local restaurants and coffe shops. I personally loved sitting out on the patio! This complex is beautiful! Close to restaurants, shopping and easy access to any part of the city. Our condo was clean, comfortable, and very nice. We had everything we needed and no trouble with reservations or the property. I would definitely stay here again! Thanks for your review Kristi and Jimmy, hope to host you again soon. Just open the door and start enjoying the surroundings. Completely equipped and super clean. One hundred steps to the pool with hot tub and BBQ. Five minute walk to grocery shopping and restaurants and less than a mile from the freeway. Owner is easily accessible and responsive when an issue arises. Great if you're looking for a minimally appointed one-bedroom in an apartment complex best suited to one or two guests. The previous guests did not leave the unit in the cleanliest of conditions, which I was well informed of prior to arrival. During my stay it had to be arranged that carpet cleaners professionally shampoo the floors, and it was handled smoothly with plenty of communication from the owner. My month-long stay was otherwise uneventful and enjoyable as a temporary home. A few notes, though a generous king size bed, the mattress is somewhat uncomfortable due to it sagging on both sides, probably needing replacement soon. Additionally, the bedroom could benefit from having blackout curtains installed for darkness and privacy, as the window faces the parking lot. Otherwise a fine place to stay, and I appreciate the rapid responses and flexibility afforded by the unit owner.